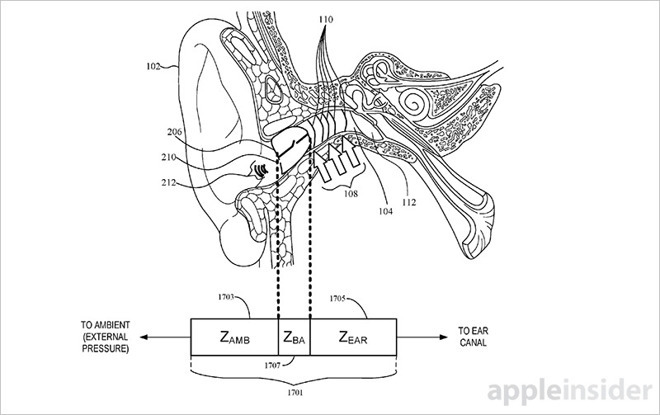 As published by the U.S. Patent and Trademark Office, Apple's filing for an "In-ear speaker hybrid audio transparency system" is a take on modern noise cancelling and management solutions that allow users to selectively drown out, or listen in on, sounds from the ambient environment. Sometimes referred to as audio passthrough, similar capabilities have become common value-added features on high-end headphones like those made by Bose. Earphones that seal the ear canal pull double duty as passive noise cancellation devices, delivering better acoustics when listening to music or talking on the phone. When users are not actively listening, or want to hear what's going on in their surroundings, passthrough systems can be activated to integrate external sound captured by an onboard microphone into the audio signal. Most manufacturers rely on microphones and digital sound processing technology in their respective passthrough solutions, but such techniques require large amounts of power. In addition, sealing off the ear canal results in amplified echo-like sounds of a user's own voice or other sounds like those created by body movement. This unwanted noise is referred to as occlusion or isolation effects. To solve the perceived issues, while at the same time maintaining high quality output and power efficiency for wireless devices, Apple proposes a hybrid transparency system that combines the best elements of sealed headphones, "leaky" or partially unsealed devices and onboard computer logic. Specifically, the invention calls for the use of an acoustic pass valve or valve flap which can be opened (vented) or closed depending on the situation. Driven by a motor or, as represented in the filing, a balanced armature, valve mechanisms are more complex than static hardware, but offer a great deal of flexibility in delivering optimal sound to end users. Further, a physical valve is more power efficient than constant DSP manipulation. For example, occlusion effects can be largely negated by venting the valve (into the stem of an earbud, for example) during a phone conversation. Alternatively, the valve can be closed when a user is listening to music, thus isolating audio content from outside noise. Apple refines the invention by adding in automation technology, leaving valve actuation up to computer circuitry and programming. In some embodiments a microphone and accelerometer are deployed to detect when a user is speaking into the headphones. Sensor data can be accompanied by signals from a paired smartphone, which might inform headphone management software that a telephone app is running. Other embodiments trigger valve operation based on audio signals gathered from the ambient environment. Motion data might also be leveraged to determine that a user is running or performing a physical activity. In such cases, the headphone valve may be programmed to vent in order to better perceive sounds in the surrounding environment, like car traffic or other people. The automated valve can even regulate ear pressure caused by fluctuations in the ambient environment. This particular feature would be a welcome addition to frequent fliers who need to equalize pressure during aircraft takeoffs and landings. 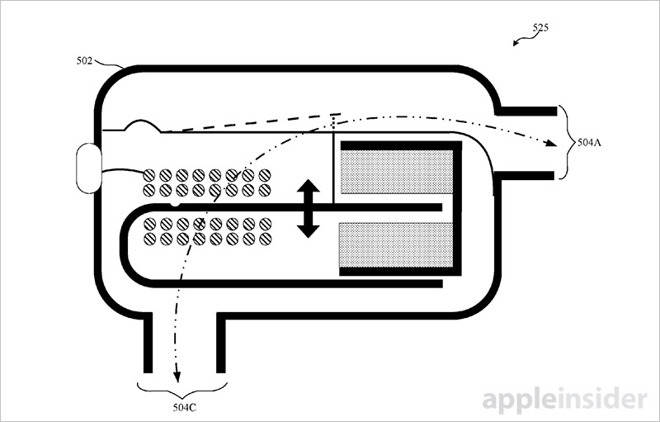 In addition to passive venting, Apple describes a sound augmentation system that operates in a similar fashion to existing passthrough technology. Activated only when the headphone valve is open, the sound augmentation system picks up audio from an external microphone, adjusts its frequency and delivers it to the user. The goal is to reproduce ambient sound to a user as if they weren't wearing headphones. Related to sound augmentation is active noise control or acoustic noise cancellation, which leverages microphone data and onboard DSP circuitry to cancel out unwanted noise. Such systems can be used in conjunction with a closed valve to further isolate reproduced audio. 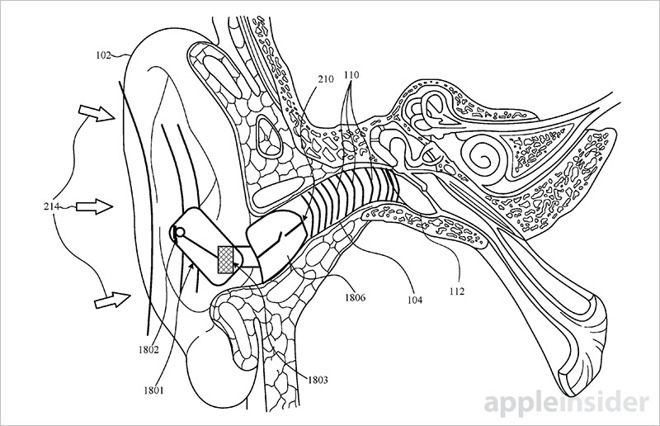 Whether Apple intends to incorporate audio transparency in a future headphone is unclear, though the company is already building advanced components capable of such feats into its current AirPods device. The wireless earphone product boasts an array of microphones, as well as an accelerometer, but lacks a fully sealed form factor. Aside from big-name manufacturers like Bose, a number of smaller headphone startups are beginning to innovate in the sound processing field. Doppler Labs, for example, markets a pair of "smart headphones" called the Here One that selectively tune out, amplify or adjust the frequency of ambient sounds such as human speech, music and more. Apple's hybrid audio passthrough patent application was first filed for in January 2016 and credits Scott C. Grinker as its inventor.